Michael Taylor Search approached us with a simple goal in mind. To launch a brand new website to launch for their brand new company. 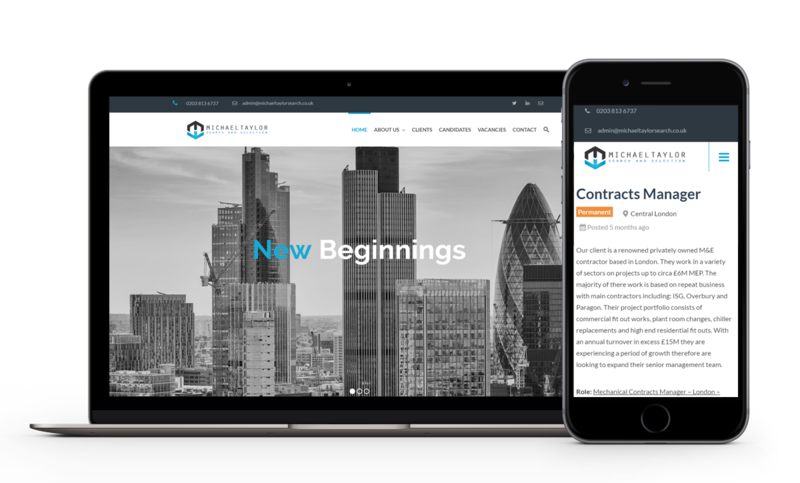 We were asked to truly take the reins with this project and provide all of our design expertise to create a clean website. It was also important that they could post jobs via the website and allow candidates to apply for them and also send CV’s to be stored on the database. “12 months ago we began a new journey; setting up and starting a new business. Branding and marketing was and still is very important to us therefore we needed a website that stood out! …However finding a design company that was affordable and delivered to our spec was not easy. After a few weeks shopping around we were recommended to get in contact with Strategies Express and organised a meeting. A couple of conversations later and work began. Throughout the process Alex engaged with us on a day to day basis. He had a firm grip of our specification and advised us on his own thoughts and designs. They were flexible and would go the extra mile in making the website fit our spec.